Charging: yes you should. Cunning skills you have, I and I’m sure others would be willing to pay for them if the price is reasonable. Human ears, toilet bowls, chunks of meat: Probably wise to keep your portfolios well separated then. Might be hard to attract clients for the cutesy stuff if they see The Other Neil at work. And yes, I agree with quinn you SHOULD be charging for this stuff. 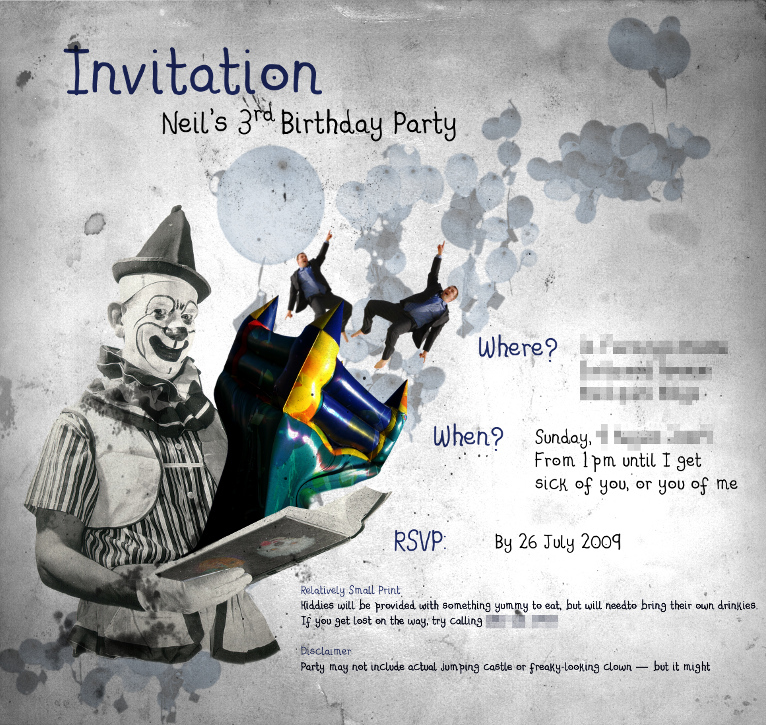 I think customised invitations would go down well with people, its something they have that no one else does. Could prove to be quite lucrative for you. I’m going to jump on the bandwagon with quinn again. Might pay to keep both of them seperate for clientele sake. I always struggle to monetise my creative pursuits. I think the middle-class social propaganda machine has a strong hold on me — i.e. work for someone else and make them rich. I think I need to build up a bit of a portfolio first. Oh look, already making excuses not to sell my work.